Review of Sly Fox Saison VOS | Beer Apprentice - Craft Beer News, Reviews, Interviews and Info. Hello guys. For today’s craft beer review I’m going to be trying a Saison VOS brewed by the Sly Fox Brewing Company located in Phoenixville, Pennsylvania. This will be my first time trying a beer from Sly Fox. Big thanks to Ryan Hudak (insearchofbeer.org) for the hookup. From the website, slyfoxbeer.com, we find this description of the Saison VOS. This particular beer has an ABV of 6.9% and it comes in a 25.4 oz. bottle. It poured a very cloudy, yellow/orange to golden color. The crown was very white, kind of soapy and fizzy, but full and fluffy. It grew to a significant girth and the retention time was more than suitable. The lacing was solid too. I could detect a steady stream of bubbles rising from the center of the snifter when I held it directly toward the light source. The bouquet presented very nice hints of lemon grass and Belgian yeast with underlying hints of funk and peppery spice. I thought I detected the most faint hint of banana in there too. This beer was super well balanced on the nose. No one fragrance really stood above the other, although I did find that the funkiness did begin to subside as the brew warmed, which allowed the yeast and spice to sort of define the overall bouquet. The taste was very lively and bright. Savors of lemon citrus with and herbal/earthy hop profile. The funk was a bit light for the style I thought, but still present enough for an appealing dose. Some Belgian yeast and breadiness were easily noticed and they revealed themselves a bit more as it warmed. A nice bitter punch was obtained, however it wasn’t lip puckering or anything. Just a nice little tickle. Again, like the aroma, I found the faintest bit of banana. All around a very solid tasting beer. The mouthfeel was medium to medium/thin. It was smooth, crisp, refreshing, thirst quenching and snappy. It wasn’t real dry though. As a matter of fact, it was a touch watery. Not bad, but not as dry as I was hoping. The carbonation was big, lively and fitting. A sturdy dose of flavor was left on the palate after each swallow as well. Man. This beer would be perfect for the warmer days of Spring and the hot, humid days of Summer. It was unbelievably easy to drink. It was a well balanced brew all the way around. 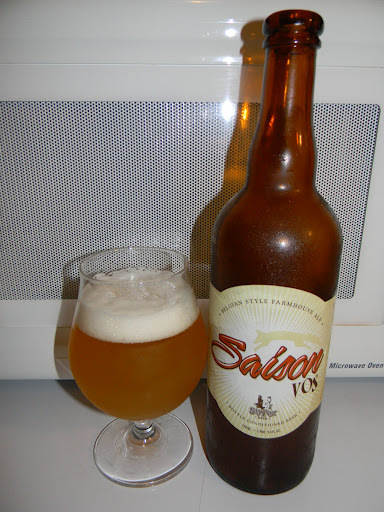 The Saison VOS was nothing too complicated I didn’t think, however it was fitting and correct for the style. I liked it plenty that’s for sure. I would easily recommend it if you are looking for a sound and stable Farmhouse Ale to try. It’s not quite the best one on the market, but I don’t think that a person could go wrong by picking it up either. I would love to have another bottle to be honest. Be sure to let me know what you thought of it if you are able to try it. I’d like to hear your take.